Published on Friday, June 30, 2017. This article appears in the June/July 2017 issue of American Craft Magazine. No Turning Back, 2013, 24 x 44 in. Early in her career, it’s said, Georgia O’Keeffe looked at the art she’d done to date, decided it was derivative, threw it all out, and began making the work that felt true to her and that would make her famous. Lorraine Bubar likes that story, seeing in it a testament to the power of realizing your own authentic vision. “People respond to that, when finally you just allow yourself to do what you’re passionate about,” says Bubar, a Los Angeles artist who found her third calling – and ideal métier – in the craft of papercutting. Using an X-Acto knife, she cuts and composes fine handmade papers into large, intricate wall pieces that vividly portray the subjects, places, and experiences close to her heart. 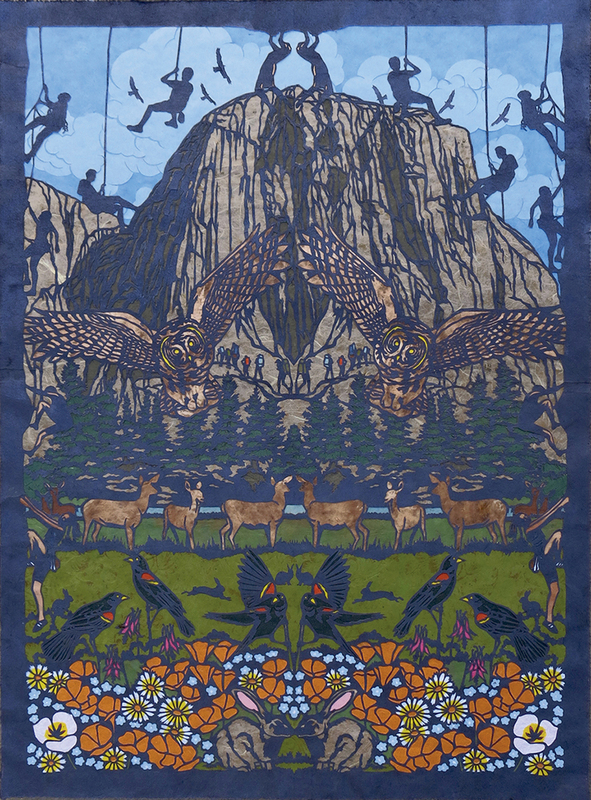 The scene might be the flora and fauna of America’s national parks, where Bubar, a nature enthusiast and avid hiker, has sojourned as an artist-in-residence. Often it’s a snapshot from her world travels, a collage capturing the gestalt of a site or culture, from the sacred “monkey temple” of Kathmandu to the ice shores of Antarctica. 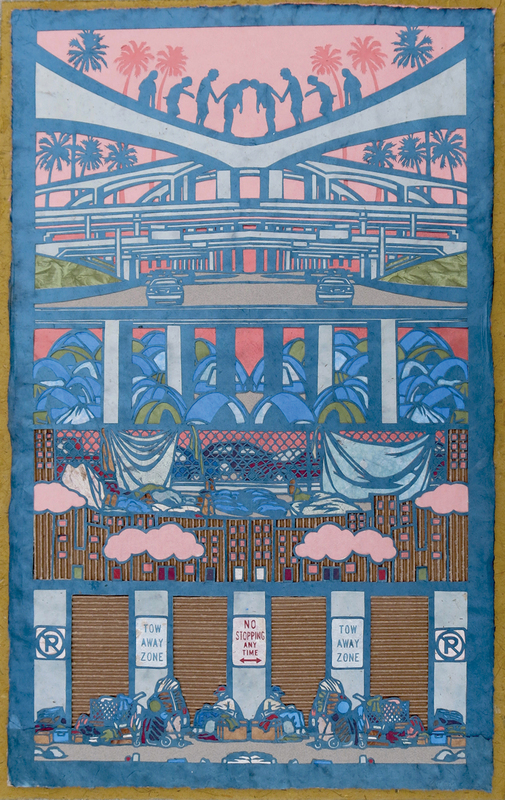 Or she’ll focus close to home, depicting Santa Monica in a convergence of flowers and freeways, palm trees and traffic, joggers and construction. In their precision and detail, her pictures call to mind stained glass, Japanese woodblock prints, and Indian miniatures, while her painterly handling of color conjures a dreamy, impressionistic aura. A native Angeleno, Bubar studied art and biology at UCLA, then worked in animation, designing effects for TV commercials and movie titles. (“That still comes out in my work, because there is always movement,” she notes. “Also, I’m interested in metamorphosis.”) Next, she spent more than a decade teaching art at a combined middle/high school. A few years ago, she fulfilled her dream, becoming a full-time artist. She painted watercolors at first, using stencils in a way that eventually led her to papercuts. Though hers is a contemporary approach – historical papercuts tend to be a single layer and color – she feels connected to a folk craft practiced over centuries and continents, including as Judaic art in Eastern Europe, where her family has roots. Her designs often suggest a hierarchy of elements radiating from a symbolic center, branching out in tree form, or tiered like living things in an ecosystem. “Layers of imagery, layers of paper – it all ties together,” she says. 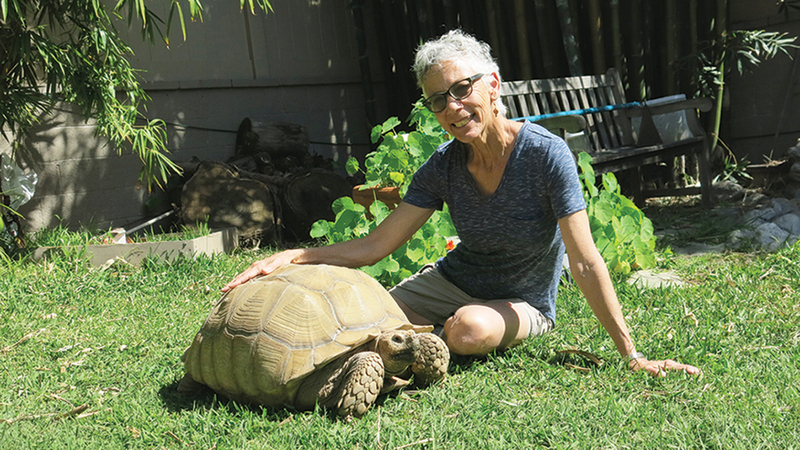 Lorraine Bubar, with one of the four tortoises that call her California backyard home and help inspire her papercuts. Some of the works honor nature. Others, such as Migration (2015), explore homelessness and other topical realities. Some of the works honor nature. Others, such as No Stopping (2015), explore homelessness and other topical realities. 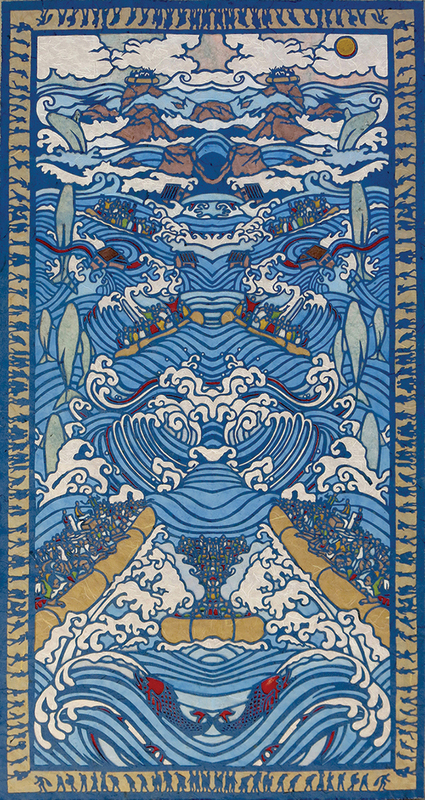 El Capitan, 2015, 34 x 25 in. 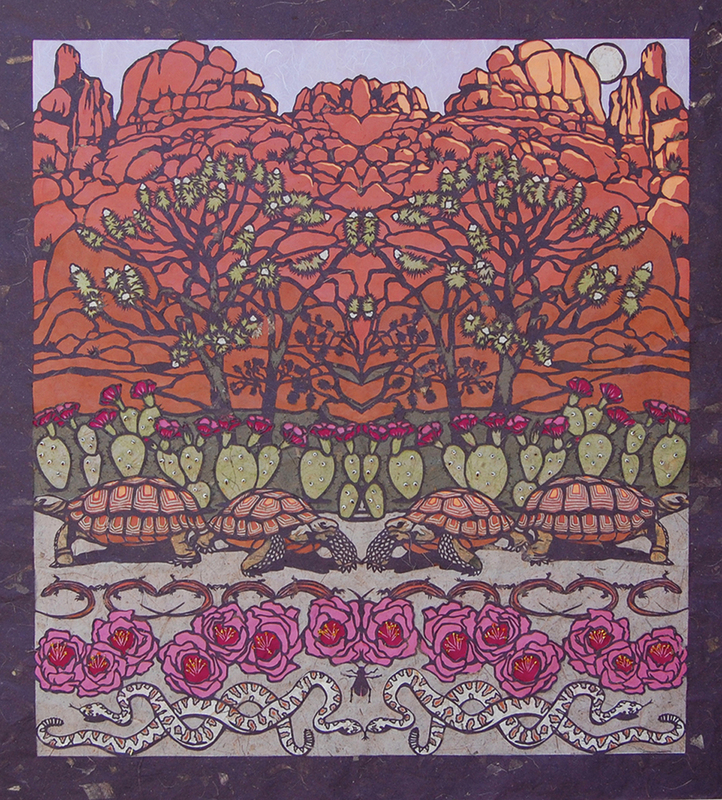 Desert, 2013, 36 x 33 in.